The Wicklow Way is Ireland’s oldest way-marked long-distance walk! The 128 km long walk takes you through the incredible Wicklow Mountains and through County Wicklow, known as the Garden of Ireland! That’s one of the reasons I recommend IrelandWays.com(use ‘MONKEYS and receive a €20 discount). I enjoyed the walk, especially through the Wicklow Mountains and the route leading to Marlay Park, these two days were my favourite. While it’s possible to walk the Wicklow Way on your own and make all the arrangements yourself, I was very grateful that I had made mine through IrelandWays.com. That way, you can have as good of time walking the Wicklow Way as I had! My favourite part of walking the Wicklow Way was walking in Wicklow Mountains National Park and through Glenmalure, the longest glacial valley in Ireland! You’ll also walk past Glendalough, a 6th-century monastic city, which is one of the most important in the country. Some of the scenery may be familiar to you if you watch the TV show Vikings including Lough Dan and Lough Tay, which you’ll pass. You’ll also get great views of Powerscourt Waterfall – the highest in Ireland! This is typical terrain on the southern part of the Wicklow Way. 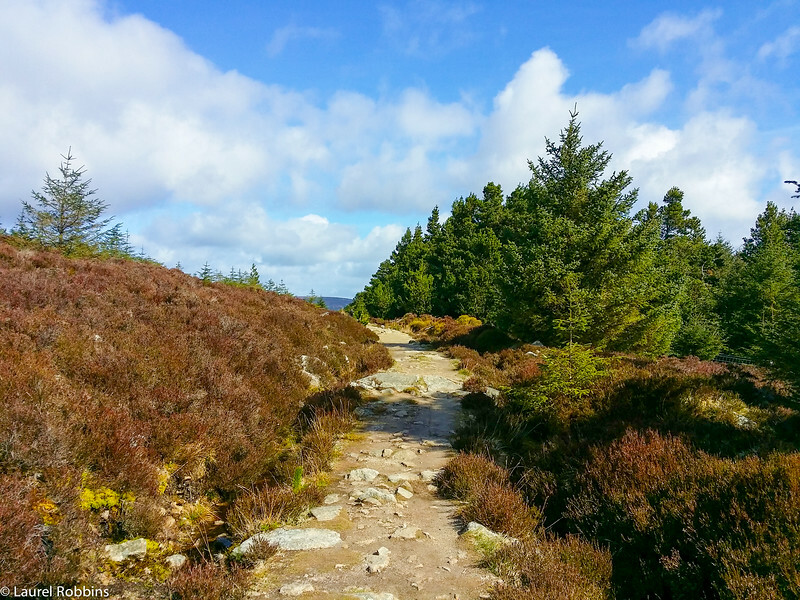 The Wicklow Way is a combination of country roads (especially on the southern part of the walk), forestry roads, hiking trails and platforms over bogs. Approximately 28% of the route is walking on roads, past fields of sheep and countryside. The highest point is 630 m, and you’ll do a total of 3753m of elevation if you walk the entire route. You’ll find yourself climbing a hill, only to climb back down, and then climb back up. Only a few instances is it really steep. If you’re used to hiking in the Canadian Rockies or have done the Tour du Mont Blanc, the elevation will seem easy. Still, don’t underestimate it. Some days you will be walking over 25km! Valley in Glencullen just outside of Dublin. 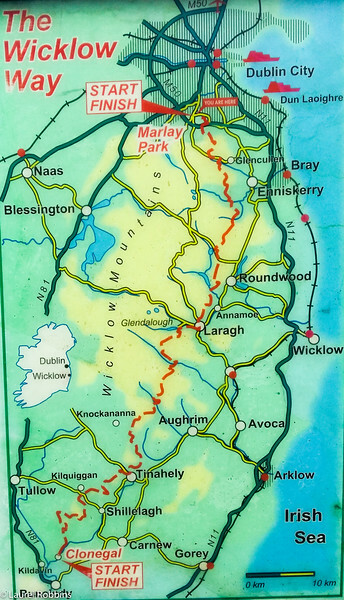 The first thing you need to decide is whether you are going to walk the entire Wicklow Way (128km) or just part of it. IrelandWays.com offers self-guided tours. I.e. they book your accommodation, arrange your luggage transfers and provide you with detailed instructions for each day of the route. It takes 9 days, including an arrival and sightseeing day. You can also choose the Wicklow Way Highlights which takes 5 days, or a short break which only takes 4 days. If you are pressed for time, I highly recommend the Wicklow Way Highlights tour. 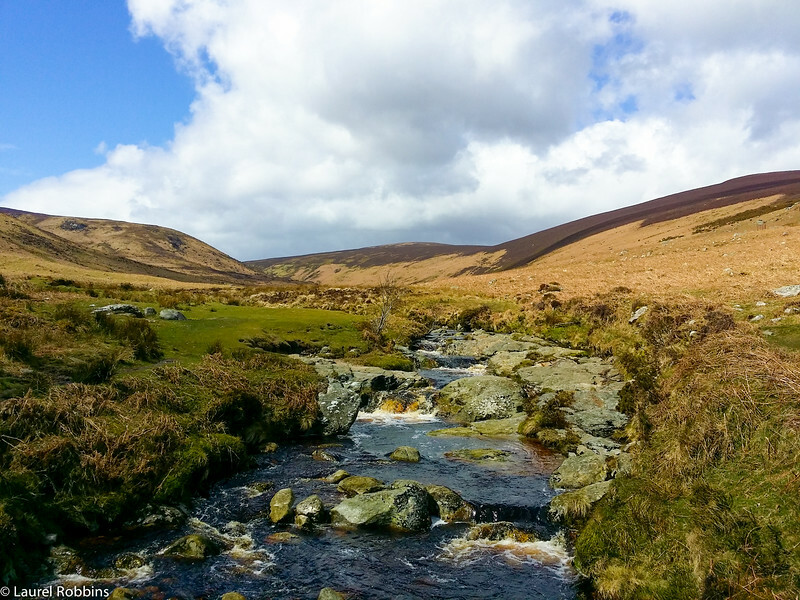 This takes you through the most impressive parts of the walk, including the Wicklow Mountains, which was my favourite part! 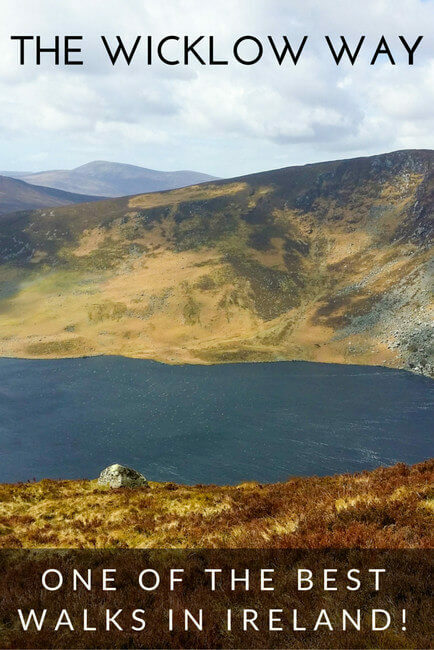 The Wicklow Way also makes my friend Leigh from Hike Bike Travel’s list of the 7 best hikes in Ireland. The Wicklow Way is well signed. Next, you need to decide whether you are going to walk it from north to south (Marlay Park in Dublin to the village of Clonegal), or from south to north. I walked it from south to north and was very happy with this choice because the more impressive scenery comes later in the trip. There’s also more elevation in the northern part of the route, so your walking legs have a chance to kick in. Finally, the prevailing wind blows from the southwest, so you’re more likely to have the wind on your back for most of your walk. You will also need a guide book and map. I used The Wicklow Way Rucksack Readers. The book provides an overall description of the Wicklow Way. It was useful, but it only provides day by day instructions for the walk from north to south. As a result, I didn’t use it very much when walking.I found it confusing since I was doing it in the opposite direction. The map, however, was very useful. I used it in conjunction with the free app mapmywalk. It tracks your progress via GPS and with the route description given to me from IrelandWays.com, which provides specific directions. The combination of using the three together worked very well. WicklowWay.com is also a helpful resource for information about the walk. Plan your route and book your accommodation. I highly recommend booking your accommodation in advance, and not as you go along. In most places, accommodation is not directly on the Wicklow Way. Pre-advanced arrangements need to be made for your accommodation provider to pick you up from a meeting point. I.e., it’s not usually obvious where you are going to stay, and there are not a lot of choices. If you can walk to your accommodation, in most cases, you need specific instructions beforehand. It’s possible to plan your route and book your accommodation yourself. This site has a list of accommodation, but it would take a lot of time and planning. It took virtually no planning from my side. They booked all my accommodations, arranged all my luggage transfers and provided me with a detailed route description each day and the phone number and address for my accommodation. It saved me a ton of time, and I didn’t have to stress about the details! I also recommend having a mobile phone on you, since you will need to call your B&B for a pick-up on at least 2-3 of the days. 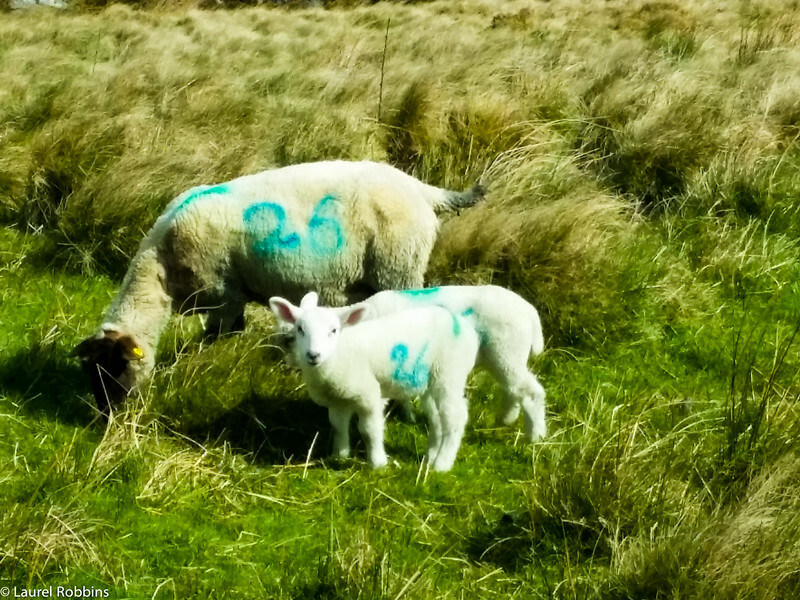 One of the things I loved about walking the Wicklow Way in spring where all the lambs! Decide whether to carry your own luggage or arrange for a luggage transfer. Confession: I’ve never had my luggage carried for me before. When I did the Tour du Mont Blanc, I carried my own. I also carried my own when I cycled the Danube. Having a lighter load makes your walk much easier. It was also very convenient to have my luggage waiting for me each day when I arrived. Since having my luggage transferred in Ireland, I also choose this option when I hiked the West Highland Way in Scotland. Alternatively, if you are going on your own, you can arrange it through Wicklow Way Baggage. Note: if you do go for the baggage transfer service, you leave your bag in the lobby for pick up. It will also be waiting for you in the sitting room for you to take up to your room. I was lucky enough not to have anything stolen, but I would recommend a good lock. It’s also a good idea to carry your valuables with you, since your luggage may be left unsupervised at times. One of the many loughs you’ll see while walking the Wicklow Way. Eating Along the Wicklow Way. Despite being in Ireland, there are only a few pubs directly on the route. There are also only a few restaurants, and often these are several kilometers away from your B&B or hotel. You will either need to walk or ask your B&B to arrange a taxi for you. For lunches and snacks, either bring food with you or ask your B&B to prepare a packed lunch for you. On most days, you will not come across anywhere to purchase food during the day. I stocked up at a grocery store in the evenings when available. There wasn’t one close by each day, so I always made sure that I had three days of food with me. I took when I needed for the day, then packed the rest in my luggage that was being transferred to keep my backpack weight to a minimum. If you have dietary requirements as I do (I’m celiac), inform your accommodation provider in advance, or if you book with IrelandWays.com, they’ll do it for you. When the B&B’s knew in advance that I was celiac, they would arrange for gluten-free bread. Had they not been informed prior, they may not have had this available. 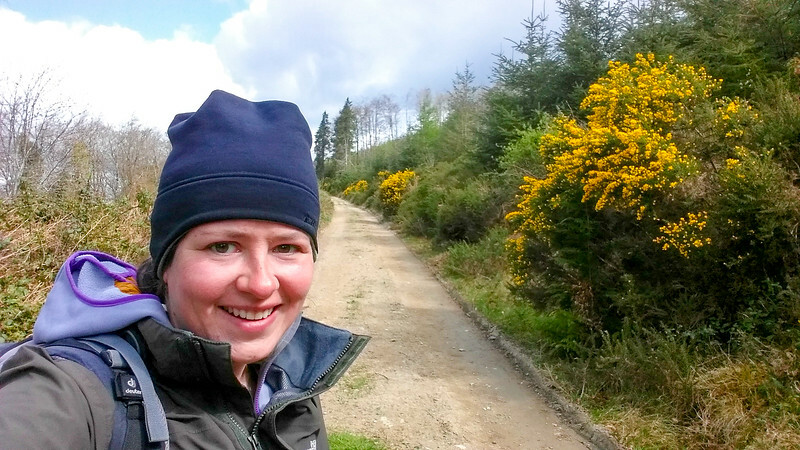 What I wore while walking the Wicklow Way – gear from Zalando. Check out my packing list for the Wicklow Way, which has everything you need for when you’re on the trail. Of special note is my favourite item that I had just bought before, a Smart Wool shirt. I wore this shirt every day I walked. You can find a similar one here. While I’m embarrassed to admit it, I only washed it once. It didn’t stink at all! I love this shirt! My second favourite item was quick-dry hiking pants. A must when you’re hiking in Ireland. You can also check out my video showing what layers I wore when walking the Wicklow Way. Note: I have purposely not included the name of the B&Bs and hotels where I stayed as a courtesy to IrelandWays.com who organized my accommodation. You can find accommodation on www.wicklowway.com. Highlights: A short walk around the village. If you’re able to make it to the Clonegal (5.5 km away), there’s Huntington Castle. Tours are available June, July, and August. The gardens are open from May to September. Where to Stay: I stayed in an old charming farmhouse B&B located just a 10-minute walk from the city center. Where to Eat: There’s a pub that serves food in Bunclody, but it’s closed on Monday and Tuesdays. I went down to the grocery store, which has a good selection of ready-to-go food and brought it back to my B&B. Additional Info: The south starting point for the Wicklow Way is the tiny village of Clonegal. It’s 5.5km from Bunclody, so stay with a B&B that will give you a ride to the starting point. Me walking the Wicklow Way from the village of Clonegal to Shillelagh. Walking Route Description: The route starts from the small village of Clonegal which is known as the Switzerland of Ireland since it’s so scenic. 65% of the way today is on the road, but with the sheep baa-ing, as you pass by, it’s not as mundane as it sounds. Much of the route is through scenic countryside, with a few jaunts up forest covered hills. Be careful on Urelands Hill – I got lost and had to backtrack. Note: Once you’re at the top of the ridge, take the first right downhill – don’t carry on the road as I did. A local informed me that it loops right back around to Clonegal – where I had started! The only part of the walk I didn’t enjoy was the part where they were logging. Highlights: I finished at the historic farmhouse Dying Cow Pub, originally called Tallon’s – which is what the sign still says. The pub is 300 years old! Unfortunately, it wasn’t open when I arrived (3:30 on a Wednesday). I couldn’t find any opening hours on site or online, so ask a local to make sure you don’t miss this famous pub! The dog was amiable though, and I hung out with him until my B&B came to pick me up. Weather: Mainly sunny/cloudy until around 1:30, then scattered showers, and some hail for about 10 minutes. # of Other Hikers Seen: Only 1 and she was going in the opposite direction. Where to Eat: There’s one restaurant in Shillelagh, but it was closed for renovations when I visited (April 2016). The only other options were: 1) taking a taxi to Tinahely, a market town where there are more restaurants/pubs, or 2) picking up something from the mini-mart in Shillelagh. I did the latter, but the grab and go section was rather limited, so I don’t recommend this option. Additional Info: Ensure you have enough food to tide you over while walking the next day, as you won’t pass any place to buy any. I picked up some at the mini-mart in Shillelagh. Note: Tinahely is ~2 km from the Wicklow Way at one point, so you could always detour here if needed. I was too lazy to walk the additional 4 km but would have loved to have seen the town. Walking Route Description: My B&B dropped me off at the Dying Cow Pub where they had picked me up yesterday. 45% of the route is on a small country road and passes through scenic countryside, rolling hills, valleys, and forest. Quite a bit of the walk was on paths through farmer’s fields, which if it’s wet, can get quite so mucky. Be sure to close any gates that you pass through. It was very picturesque. 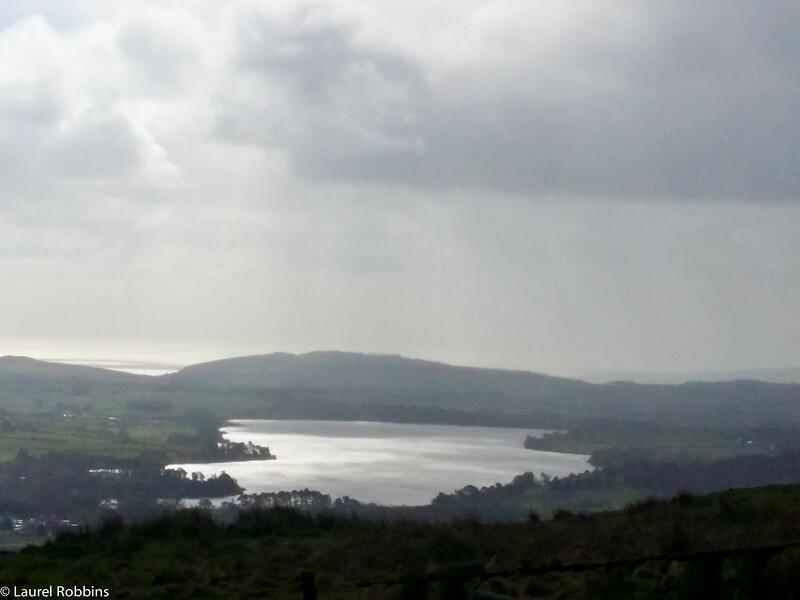 Highlights: Seeing two herds of deer on Muskeagh Hill and the valleys – just gorgeous. Weather: I woke up to the sound of pitter patter on the skylight of my B&B. Fortunately, it stopped before I headed up. For the most part, it was cloudy with bits of sun until 12:30. Then there was heavy rain for ~30 minutes, followed by scattered showers. # of Other Hikers Seen: 0 while hiking, but had a lovely dinner with two other hikers from Denmark at my B&B. Where to Stay: I stayed at a B&B just 900m from the Wicklow Way and walked there. Where to Eat: My B&B had the option of having supper there for an additional cost (€12 for a main course, €5 each for soup and dessert). The closest village that has restaurants is Tinahely, ~10km away. If you’re just craving a pint, the closest option is the pub in Knockananna (which doesn’t serve food), ~ 3km away. Additional Info: At least at the B&B that I stayed at, located in the countryside, there was no grocery store/mini-mart. The nearest village is Tinahely. Ensure that you have brought enough to eat from the previous day. Alternatively ask your B&B nicely if they’ll pack you a lunch for an extra fee. Walking Route Description: Much of the route today was walking along forestry roads. Farmland quickly turned into forests, and the hills became more numerous and larger. The route also takes you through quite a bit of wood harvesting. Part of my route around and in Drumgoff Forest Recreation Area was re-routed. Fortunately, signs marked the alternate route. Highlights: Seeing deer on three separate occasions, seeing snow on a couple of hilltops (didn’t expect that in Ireland at the end of April!) and entering the valley of Drumgoff – gorgeous! Wildlife Sightings: Birds and deer – no rabbits today! Weather: I woke up to snow which melted by the time I finished breakfast. There was a tiny bit of rain and hail, and although it remained cloudy, it was the driest day I had. It did start to pour at around 2:30 – right after I had arrived at my B&B for the night – whew! # of Other Hikers Seen: 4 in one group near the end of my walk in Drumgoff Forest Recreation Area. Where to Stay: I stayed at a B&B in Drumgoff. Where to Eat: I ate at the pub/restaurant attached to the B&B in Drumgoff. Additional Info: As far as I can tell, there’s nowhere else nearby to grab something to eat, so ensure you have enough with you or eat at the pub/restaurant in Drumgoff. Walking Route Description: This has been my favourite day of walking so far! You’re no longer looking at the Wicklow Mountains from a distance; you’re hiking in them! 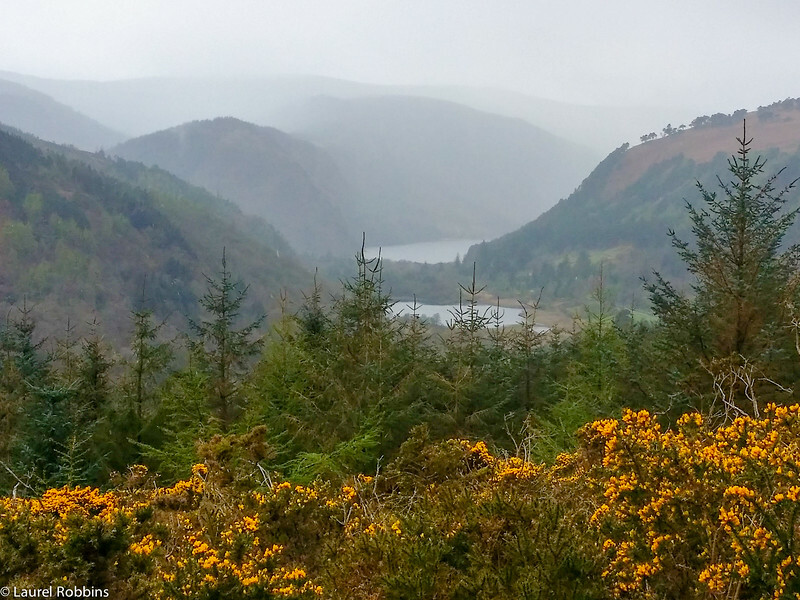 It’s also where things start to get busier, notably around the Valley of the Two Lakes in Glendalough Valley in Wicklow Mountains National Park. You also pass by one of the most important monastic sites in Ireland. It developed into a Monastic City and dates back to the 6th century! While it was strange being around so many people again, I can see why the Glendalough Valley is so popular. It’s a beautiful, and historic area! 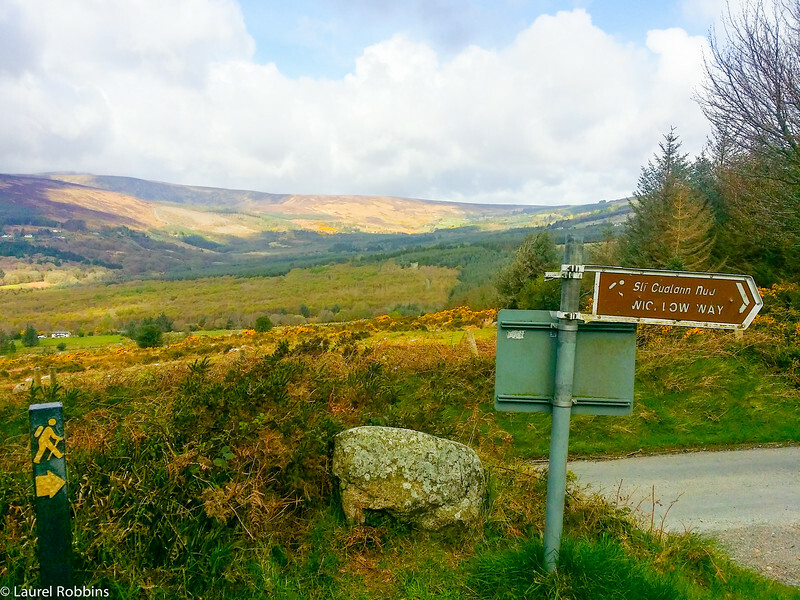 Highlights: I loved the hiking trails in the Wicklow Mountains, the views of the Valley of the Two Lakes and walking through the Monastic City. Wildlife Sightings: Just birds today, but it was raining. Weather: I was excited to wake up to the bluest skies I’ve had on the entire trip so far. Unfortunately, they didn’t last, and it sprinkled most of the morning – not hard enough for me to put my rain pants on though. It cleared up around noon. Where to Stay: The Glendalough Hotel or in one of the many B&Bs in the nearby village of Laragh, which is what I did. Where to Eat: I stopped for lunch at Casey’s in the Glendalough Hotel. It was busy and filled with tourists, but the food was good. I also stopped for a cappuccino and a gluten-free cake at the Glendalough Fayre, which also has a shop. I LOVED this place, a tasty gluten-free cake is hard to find anywhere, and the piece I had was especially good. There are a couple of restaurants in the village of Laragh, along with a convenience store that sells grocery items. Monastic City in Glengalough, one of the most important monastic sites in Ireland. 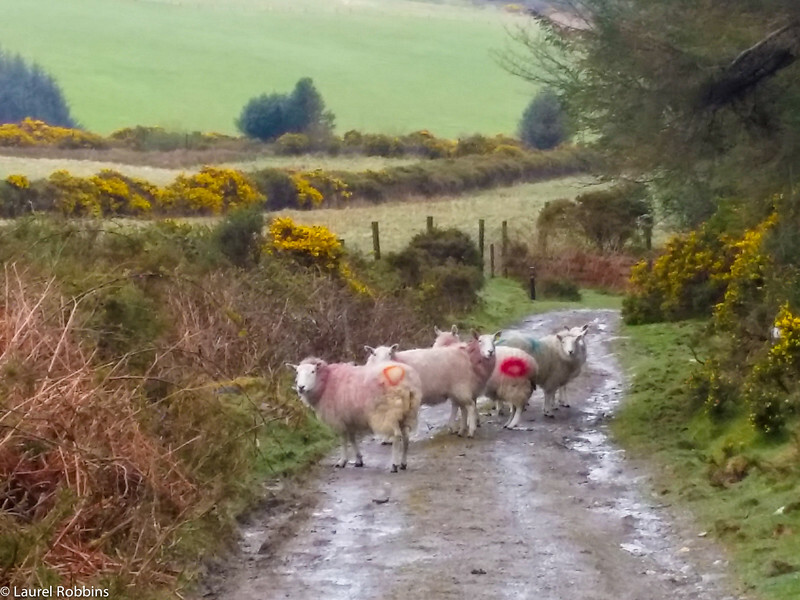 You will see a lot of sheep when you walk the Wicklow Way! Walking Route Description: A lot of today’s route is walking along a road, including a relatively busy road into Roundwood. I did enjoy the walking paths and getting mistaken for a sheep herder on one path. Guess I’m really starting to fit into my surroundings? Highlights: Today was my least favourite day of walking so far. The scenery was OK, but not amazing – perhaps that was due in part to the rainy weather. I did enjoy the hiking paths. Wildlife Sightings: One herd of deer. Weather: I was excited to wake up to the sun, but unfortunately that had turned into rain by the time I had started walking. It rained on and off for most of my walk. # of Other Hikers Seen: Several coming from the opposite direction. Where to Stay: I stayed in a hotel in the village of Roundwood. Where to Eat: There are four pubs in Roundwood, a convenience store, cafe and several takeaways so you have several options. Additional Info: You can visit Johnnie Fox’s Pub, the highest pub in Ireland at ! I had a pint there, because how could I not! “Guiness Lake” in the Wicklow Mountains. The Guiness Estate lies at the end of the lake. Walking Route Description: I LOVED the walk today! Only 20% of it was on roads, meaning I spent more time on hiking paths. That’s always a plus in my book! I got excellent views of Louch Dan, which I had visited yesterday, but was more spectacular from this angle. I saw Lough Tay – also known as Guinness Lake since the Guinness estate is on one end of the lake (estate is not pictured). What I loved most of all was walking along the bog on White Hill and Djouce Peak. I was up high enough to get spectacular views! As I descended, I got views of the Irish Sea AND passed by Powerscourt Waterfall – the highest in Ireland at 121m. It’s also worth noting that I did lost at around the 7th km mark along the forestry road- it’s tricky so be careful. I found my way on the trail again, but I never find out where the correct point was to descend, adding an extra 1km to my route. Highlights: Walking along White Hill and Djouce Peak (not quite to the top – I turned off at the Wicklow Way marker), seeing Powerscourt Waterfall and the Irish Sea – so many highlights today! Weather: Warm and sunny for the morning, then really windy, and a hail storm. It was so windy that the pellets actually hurt when they hit. I was on White Hill on the bog with no place to duck for cover so carried on. 30 minutes later, the sun was out and it was a gorgeous day again! # of Other Hikers Seen: A few mountain bikers at the beginning, and then too many hikers to count on White Hill and descending from Djouce Peak. Where to Stay: My pick up point was at the Crone Woods Car Park. From there, I called my B&B to pick me up. Where to Eat: The nearest place to eat was a pub, or in Enniskerry. Both were 3km away, and you had to either walk or take a taxi. 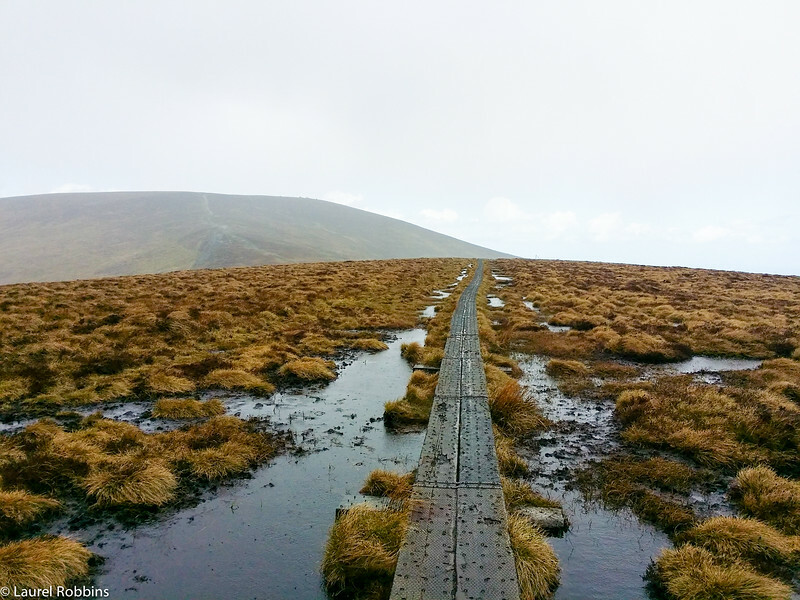 I loved walking over the bog on White Hill in the Wicklow Mountains. Once it stopped raining, the views were incredible! Views over Dublin and the Irish Sea from Two-Rock Mountain, near the end/start of the Wicklow Way. 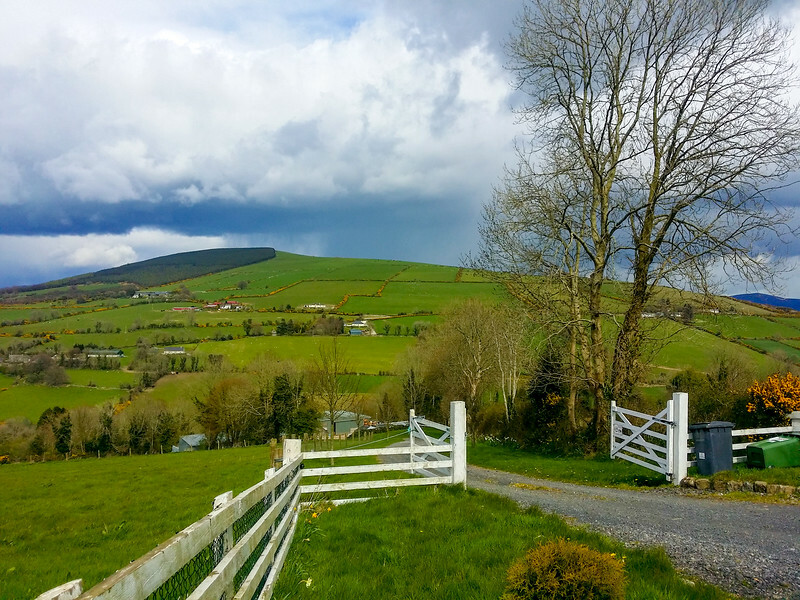 Walking Route Description: Much of the walking route today was along paths or boardwalks with gorgeous views of the Wicklow Mountains, valleys and the Irish Sea. Highlights: I loved the frequent open views of the Irish Sea. Today, was my second favourite day of walking the Wicklow Way. I was also giddy knowing that I was getting close to finishing – not because I wanted to be done, but for the sense of accomplishment. Wildlife Sightings: Birds, but no deer or rabbits today. Weather: Sunny and the warmest day I’d had so far. # of Other Hikers Seen: Too many to count, as I came closer to Dublin. Where to Stay: You arrive back in Dublin, so you have your choice of accommodation. Where to Eat: There are so many places to eat in Dublin, but a requirement for me was stopping for an ice-cream in Marlay Park near the Wicklow Way sign. Additional Info: The Wicklow Way sign in Marlay Park is near the car park, not far from Marlay House. Just outside the car park on Grange Road, you can catch a bus to the centre of Dublin. Start/finish of the Wicklow Way in Marlay Park, Dublin. It’s a beautiful route through the Garden of Ireland, and a wonderful way to experience Ireland at a slower pace. If you are hard-core mountain hiker, you may find it too easy. While the Wicklow Way was easier than my usual type of hikes, I still enjoyed it and slept very well at night after walking over 20 km some days! It made my planning so easy and saved me a ton of time. I also still independent, walking alone and not with a group, which I prefer for most walks. I’m sure I would have gotten lost a lot more left to my own devices, and I may not have chosen the most convenient accommodation providers. That’s why I’m happy to recommend IrelandWays.com. Disclosure: Thank you to IrelandWays.com for making my journey of the Wicklow Way possible. As always, all opinions are my own. If you use the discount code above, I will receive a small commission, at no extra cost to you. @Carl - Small world :). Glad your enjoyed it, thanks for your comment. It's so green! I've never done a multi-day walking/hiking trip before but I'm liking the idea more and more lately. I have a bad back so one of my doubts has always been walking around with a backpack all day, but if luggage service is an option, that would definitely make things easier. @Edwina - It's very green! If it's your first walk, I'd recommend one of the shortened versions of the Wicklow Way with the luggage transfer option - definitely is easier on the back! Best of luck! This is super helpful! I've been looking for more detailed info on the Wicklow Way and this was great to read through. Do you know if they book the same B&B's most of the time? trying to track down a list of the hotels so I can do some research. Thanks again! @Robin - Glad to hear it. Yes, I beleive so as they have a list of their favourites that they know clients love so try to use those whenever possible. Helpful info! We’ve done two walks in England and really enjoyed it. One of the aspects we enjoyed is arriving in a small town at the end of the day and finding a few good pubs with a couple of different options for food. Do you feel the Wicklow Way would suit our needs or would a different walk in Ireland be a better option? Thanks! @Dale - Glad that you found it helpful. Yes, the Wicklow Way is good for this. I ate in a pub on many nights and on some days you can stop for lunch in a pub. If you book with Ireland Ways https://irelandways.com/ways/hiking-wicklow-way/hiking-wicklow-way and use the code "MONKEYS" you'll get a €20 discount. Laurel, Thanks for an interesting and informative blog on the Wicklow Way. I'm hiking it (south to north) next month and found your description and information very helpful. Sláinte! @Glenn - Glad it was useful. I wish you a very successful hike! Thanks for your comprehensive and informative outline of your trek. I am thinking of walking 3-4 days of the Wicklow Way in September. Do you think there are likely to be other people on the track at this time of year? I don't really want to walk with a group but don't want to be completely isolated either. I have done a few multi day walk in other countries but am not from Ireland so am unsure about walking conditions etc. Thanks for any comments...I realise that you cannot really be definitive in your reply. @Christine - My pleasure. I only encountered a few other hikers the first few days but there will be lots of day hikers once you reach the Wicklow Mountains. I also met a few other hikers at the accommodations I stayed at which was nice as I was also walking by myself. Hope that helps. Thank you for your description! My cousins and I are starting in Marlay Park and walking to Clonegal this summer. We are hoping to do it in 5 days. My mother was born and raised in Clonegal and my cousins are all from there. So, we are being dropped in Dublin and walking home. We are considering: Day 1: Marlay Park to Enniskerry Day 2: Enniskerry to Glendalough Day 3: Glendalough to Glenmalure Day 4: Glenmalure to The Dying Cow Day 5: The Dying Cow to Clonegal As an experienced hiker - are we being a bit aggressive? I have done the Marlay Park to Glendalough bit before, and with no training whatsoever, I was quite sore! I am getting myself prepared this time around! Any thoughts would be much appreciated.